Taper Duel is a new project created by two young and experienced musicians from the Spanish folk / jazz scene. Jorge Arribas (La Musgaña, Celtas Cortos) and César Diez (Rao Trío, María Salgado) join their talents with a common goal: to recreate diverse traditional European music styles from an open musical and cultural approach. A new language is born out of their complicity, built up after years of sharing the stage in different projects, where the musical blend has always been a common factor. Improvisation, creation and tradition are interweaved to create Taper Duel’s unique sound. An open door for innovation and for the universal language of emotions. The trio proposal includes Adal Pumarabín’s collaboration, a percussionist from the Canary Islands who, through his ethnic and racial language, makes Taper Duel’s music travel to a folk/jazz band concept, thus creating a more surprising and organic live performance. Jorge began playing accordion and flute at the age of 12 in Valladolid, and ever since then he has combined his academic training with the participation in traditional, folk music and chamber groups. 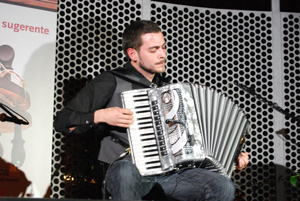 He ended his higher degree in music specialised in accordion in Madrid and returned to Valladolid where he combines touring with bands like Celtas Cortos with his own projects. In 2005, Jorge became part of the band “La Musgaña”, a turning point in his career that would give him a different view of traditional music, entering a learning period that would lead him to share and expose Castilian music in the United States, Canada, France, Algeria, Russia and Morocco, among other places. As a result of his extensive travelling, his continuous learning, the discovery of new colours and understanding of tradition, two new duo projects emerged: "Taper Duel" with Cesar Díez (electric bass) and "Fetén Fetén", with the violinist Diego Galaz, a project which originated from the musical complicity created during the tours with La Musgaña. Jorge continues to work on his projects while continuing to learn, working in studio recordings, as a musician or composer for theatre, with educational projects (Editorial Anaya), as well as collaborating with artists from different genres (Nacho Mastretta, Ibérica de Danza, Zoobazar, Korrontzi, Celtas Cortos, Zenet, etc.). Electric bass guitar, fretless, bouzouki, loop station. Born in Valladolid in 1974. 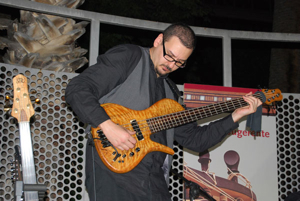 He studied classic guitar in Valladolid and electric bass guitar at TALLER DE MÚSICOS in Madrid with Richi Ferrer, who stirred his interest in jazz. Since then, he has studied with Ramón Paus, Jorge Cerrato (Jato), M. Ángel Blanco, Chema Vílchez, Chema Sáiz, y Bobby Martínez, at different courses and seminars. In the year 2000, he created Rao Trío together with Diego Martín and Germán Díaz, with whom he started performing at international concerts in Norway, Finland, France, Ukraine, Moldavia, Russia, etc. He has also taken folk and flamenco projects to other countries such as China and Cuba. Currently, among César’s own projects, it is worth highlighting Taper Duel, El Hombre Astral and Kéltiber, where the search for common ground to host folk, jazz, rock and flamenco remains the leitmotiv for his creations. Since a few years back, he collaborates with José Luís Gutiérrez, María Salgado, Raúl Olivar, etc. and large ensembles such as gospel choirs, jazz bands (big bands) and the Castilla y León Symphonic Orchestra. At the international level, he has also worked for Michelle McCain, Ute Lemper, Bob Mover and Ravi Prasad, among others.